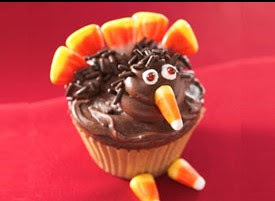 I'd like to put an end to all of that rebellion and make good use of the rest of our leftover Halloween candy with some fun dessert ideas for Thanksgiving turkeys. I went on a little internet search and this is what I found. 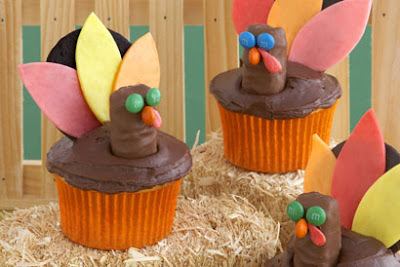 Spearmint Baby creates a turkey with Starburst fruit chews, mini m&ms and some mini Twix bars. I like to get the kids involved in these projects using store bought products (or as I said before, Halloween leftovers) to make it fun and easy for them. 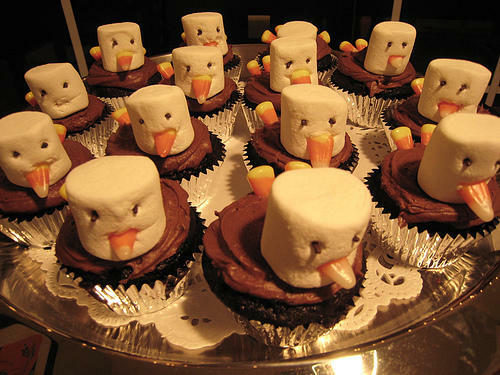 This one is a super simple idea found on Bridgette Lee's Flickr photostream using a large marshmallow, mini chocolate chips for eyes and some candy corn. 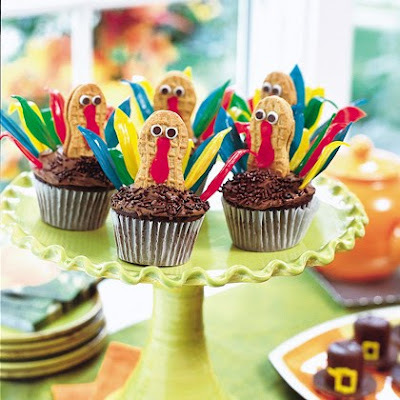 Amazing Moms has this adorable idea for a turkey cupcake -- an Oreo AND a Nutter Butter! Yum! 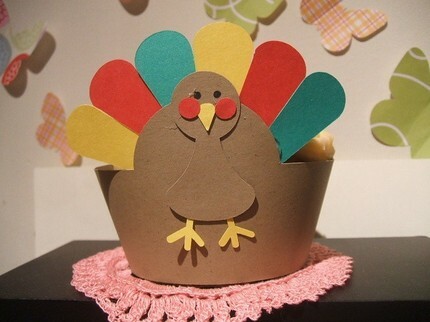 Add a cute cupcake wrapper that the kids can make themselves, too. 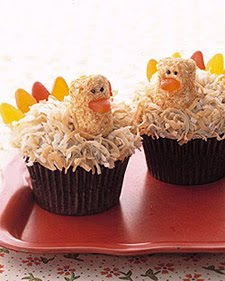 These are sweet and pretty, too, from Martha Stewart made with coconut marshmallows, toasted coconut and a gummy fish for a beak. This Turkey Cookie Sundae by Gourmet Mom on the Go has me drooling. My kids would soooo love to get their hands on this one! This chocolate cupcake from Betty Crocker would please old and young alike -- who doesn't love chocolate? 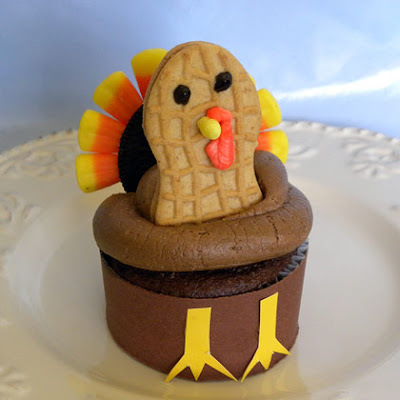 And another cute idea for a turkey cookie from Betty Crocker. 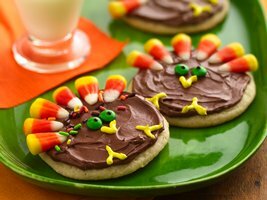 Sugar cookies, chocolate frosting and some candy corn and you've got a simple little turkey treat. Family Fun has another favorite treat made with Nutter Butters and fruit roll ups. Cute! Cute! I found this one on Cupcakes Take the Cake. It's from a sweet Etsy shop , and they are only $7 for a dozen -- how cute! I hope this little round up inspires you to make something fun with the kids this weekend -- and oh yeah, get rid of all of those wrappers! Stay tuned for a full Thanksgiving display on the blog Monday from the decorated dinner table to everyone's Thanksgiving favorite -- the dessert table. I'm super excited about sharing this one!